In terms of nutrition, there are two main health benefits when consuming these oranges: Vitamin C and Folic Acid. One of these oranges packs around eighty calories. Vitamin C is the main reason (apart from the fact that blood oranges are just so damn tasty!) that you will want to eat blood oranges. Since blood oranges are citrus fruits, they are a very good source of Vitamin C, also recognized as ascorbic acid. In the past, sailors who had the disease known as scurvy were cured by eating lots of oranges. In terms of health benefits, vitamin C is an antioxidant required for a large number of metabolic functions in the human body, and can aid in repairing tissues and ensuring healthy gums. Another one of the health benefits of Vitamin C is that it aids in healing wounds and shows benefits on the adrenal gland function. Vitamin C is not produced by the human body and therefore must be produced by our diet. Two blood oranges are more than enough to comply with the recommended daily intake of vitamin C.
This is also known as Vitamin B9. Studies show that folic acid helps against some cancers and heart disease. It is generally recommended for pregnant women before conception as folic acid is vital for forming red blood cells in the body, and thus prevents birth defects. Experts also claim that it helps to lower blood vessels. Through blood oranges alone, eating just one or two will not be enough to reach the recommended daily amount of folic acid. Either eat other fruits, or you will need to eat around five to six blood oranges. Blood oranges’ red pigmentation contains anthocyanins, which are basic natural compounds that give color to fruits, plants and vegetables. Nutrition experts believe that anthocyanins have anti-inflammatory properties that affect the collagen, and are also good for preventing cancer, diabetes and bacterial infections, as well as reducing the risk of heart disease. Studies show that they also help against illnesses that come with age. Another one of the health benefits of blood oranges is that they help to defend blood vessels from oxidative damage. In addition, they help prevent LDL cholesterol accumulation. 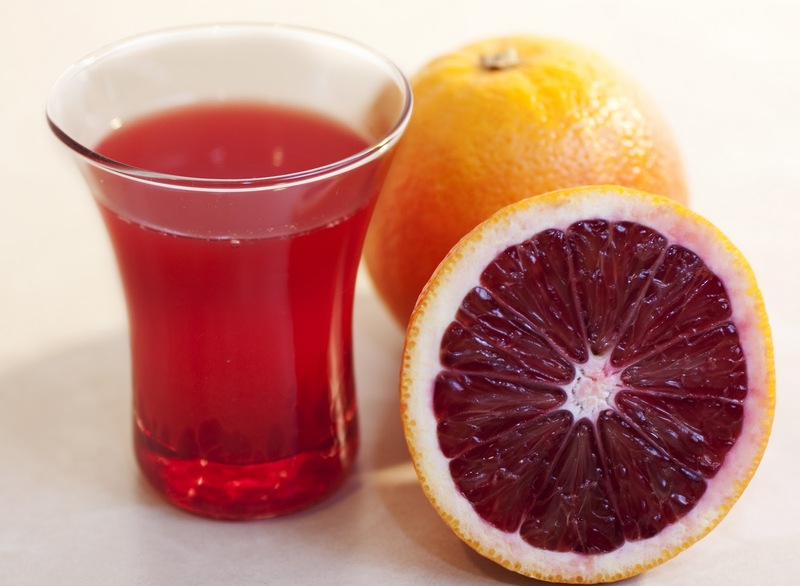 In general, the anthocyanin in blood oranges will help the body heal itself. Calcium helps with bones and teeth. It gives bones strength. Since most of our bodies stand in place due to our bones, calcium is an absolutely vital mineral. Blood Oranges contain some calcium and are thus a good source of this mineral. This is another absolutely necessary vitamin for the body. One of the main health benefits of Vitamin A is that it maintains health of certain tissues like the retina. It helps in growth and keeps the skin healthy and promotes regular development of skeletal tissue and teeth. In short: It really is the crimson tint that really makes blood oranges healthy. Just think about it, these fruits are grown in the volcanic atmosphere of Mount Etna in Sicily. This is what has given them such high levels of antioxidants, which gives them these unique health benefits that are simply not found in normal oranges. Ethanol extracts from prickly pear cactus fruit and stems were prepared and used to evaluate the pharmacological activities of the plant. The Korean study found that both extracts suppressed paw edema in laboratory animals and had a potent inhibitory effect against leukocyte migration, which is an important mechanism in the development of inflammatory diseases. words, instead she asked me softly, why? Small details of your lives really matter. Not the mansion, the car, property or money in the bank. Find time to be your spouse’s friend. Build intimacy.